It has been fifteen years since Rom Sebastian was given a cryptic ancient vellum and a vial of blood by an old man who claimed that the blood would bring those who consumed it back to life– because, unknown to all but a few, the whole world is actually dead, stripped of all emotions save for one: fear. It has been six years since Jonathan, the boy who was prophesied to become Sovereign and bring the world back to life was killed by Saric, brother of Feyn who was to be Sovereign but gave her life to make way for the rightful ruler nine years before. Now, resurrected and more evil than her brother who brought her back to life with his blood, Feyn has made it her ultimate mission to destroy Rom and his fellow Sovereigns– those who took Jonathan’s blood after he was slain– along with the prince Roland and his Immortals– enhanced, extremely dangerous beings who have only injected themselves with Jonathan’s blood before he was killed. Extremely outnumbered and facing total destruction, Rom and the thirty-seven remaining true followers of Jonathan must rely on the power of faith and love to lead them to true sovereignty. It takes a lot for me to be surprised when I am reading a book. Most of the time, I can guess the general direction of where a book is headed. 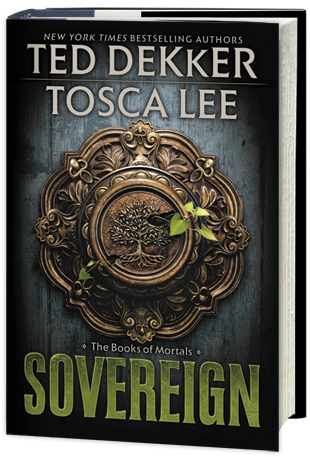 Sovereign, though, is not one of those books where I was able to do so. Every twist and turn is so unexpected. If the book were a rollercoaster, the turns would be sharp and winding, preventing you from being able to even guess where it is going. Ted and Tosca did a great job of doing something different than what they had done in the previous two books. Throughout the trilogy, Ted and Tosca have done a wonderful job of characterization. Rom, who was once a Corpse void of almost all human emotion, is a character that readers will be able to empathize with and feel his pain. Roland, the Immortal prince is an extremely intriguing character, though we do not get to see the story through his eyes. Jordin, who the story is mostly about, wasn’t my favorite character in Mortal, but she grew on me quite easily in Sovereign. And Feyn… In every book in this trilogy, she has proven herself to be one of the greatest characters I have ever come across. You love her, yet you hate her. You love to hate her, and you hate to love her, but you also love to love her, and hate to hate her. She is an amazingly complex character. I am positive that followers of this trilogy will be extremely satisfied with its intense, fast-paced ending? Or is it really an ending?